Acknowledged author Joseph A. DeVito wrote Essential Elements of Public Speaking comprising 336 pages back in 2017. Textbook and etextbook are published under ISBN 0134402863 and 9780134402864. 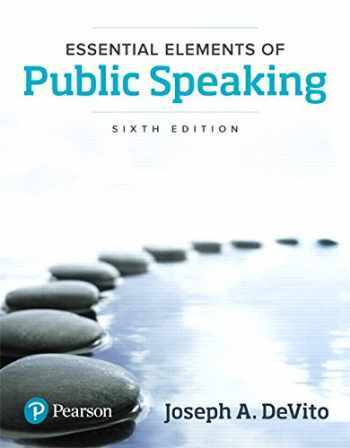 Since then Essential Elements of Public Speaking textbook received total rating of 3.5 stars and was available to sell back to BooksRun online for the top buyback price of $48.93 or rent at the marketplace. For courses in Public Speaking A streamlined approach to public speaking essentials Essential Elements of Public Speaking employs an efficient approach to help beginning students master the key skills of the effective public speaker. Author Joseph DeVito breaks the process of public speaking into 10 discrete steps and covers each step in detail to give students everything they need to prepare and present successful speeches. In addition to the latest research and updated examples, the Sixth Edition offers more in-depth coverage of how to use multimedia presentation aids, which has become an essential part of today’s public speaking. Essential Elements of Public Speaking, Sixth Edition is also available via Revel™, an interactive learning environment that enables students to read, practice, and study in one continuous experience.